As most of you know, we lost Mister A in April 2008. He lived a glorious and long life and is still deeply loved and missed. Currently on lease to Leslie Ayers, Congratulations! aka “Harry,” 20 year old chestnut warmblood gelding. Trained to Prix St. George/I1 by Suzan. Harry has been part of this family since birth and we love the big lazy galut. 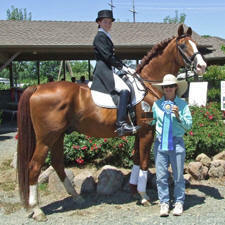 He has helped to teach countless riders dressage and jumping safely and with confidence. Harry has given so many different riders blue ribbons in dressage, hunters, equitation over fences, 4 foot jumpers on the grass and horse trials, a truly valued member of our family. He is also sure Suzan is his mom, ever since she pulled the placenta off his nose so he could breathe. 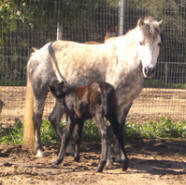 aka “Elanor,” 16 hand bay ASB mare approved First Premium AWR broodmare. Dam of seven gorgeous and Champion foals. 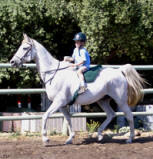 Schooled to 2nd/3rd level, Elanor’s expertise is teaching riders quiet seats and lateral work. aka “D.G.,” Her nickname stands for “Drinking Girl” given to her by 3 year old Roxanne when she was first born. A Legion of Honor Half-Arabian out of the Queen, Elanor, D.G. is schooled to 4th level and an excellent Schoolmistress, most students’ first choice. aka “Penny,” Also out of Elanor, by an Oldenburg stallion. 16 hand dark bay, 9 year old mare. Penny is the sweetest, most personable creature, even to the point of smelling like honey. Penny is a 3rd Level National Champion and is also a very capable 3 foot hunter. Now showing Prix St. Georges. Magenta – A fine young lady. 2005 filly by Mister A out of Elanor. 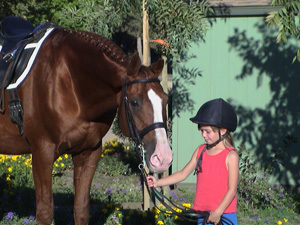 Grown into a big gorgeous performance horse, if Roxanne's schedule permits you may see her in the show ring this year. 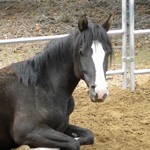 Handsome black gelding with chrome that Rielly will be starting under saddle this summer. Our last foal from Mister a and a sweetheart just like you would expect, Hope to be showing him next year on the Arabian and Dressage circuts. Worth his weight in gold, 28years old, 14.1 hand grey Arabian gelding. The ultimate beginning child’s lesson horse, Sam’s favorite ride. Patient and wise, this gentleman is an expert in starting young people on their riding journey. Another worth her weight, 11.1 hand, 13 year old grey pony mare. Rielly’s best friend in the whole world, perfect communication exists between these two. Dinah is also an excellent hunter pony and the best child’s leadline lesson pony. Suzan loves her because she takes such good care of her wild child, Rielly. 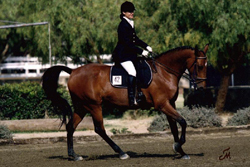 13.1 hand bay 2001 pony gelding, son of D.G. 2006 USDF All Breed Award Champion Half-Welsh, Jr, Training Level. Now knows all his lateral work, single changes and PIAFFE, learning passage.